Last fall I read an amazing little time travel book called The Dresskeeper by Mary Naylus. I gobbled it up! It was so good! I read it in one sitting, and learned so much about history in the process. Let me introduce you its author Mary Naylus! Thanks for stopping by Mary! 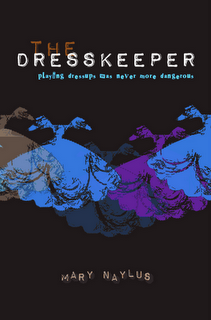 How did you come up with the idea for The Dresskeeper? Well, I love history, and the bits I love about history the most are the everyday, ordinary things like what people wore, what they ate, how they looked and so on. I tried to combine this love with a story that might appeal to a modern-day teenager, and asked myself: ‘What if a 21st century tomboy found herself back in the 1600s?’ Then I had to work out how to get her there – hence the dresses. There is SO much history filled in your novel. I feel it is a great way to get kids to learn about history. Did you set out to write a historical fantasy novel? Yes and no. As mentioned, I am fascinated by history but am conscious of not letting it overtake the story. So I set out to write a story about a teenager confronting changes in her life, and used the historical aspects and the time-travel as a backdrop. Your next novel, The Plaguemaker is being released this summer, can you tell us anything about it? Sure. The Plaguemaker uses history as well, but in a completely different way. This one is a ghost story – the ghosts being children who died as a result of the 1665 London Plague. This time, the protagonist is 15-year-old Blessie, whose experience of the ghosts leads her to delve into the past to protect her family’s future. What is the best part about being a published author? Having wonderful people like you and your readers appreciating my work. Unless readers like what I do, I feel the whole process is pretty pointless. Take us through your typical writing day. Well, I work from an outline (something Prospera asked me to write about in their Getting Published newsletter, in case there are would-be writers who are interested). So I start with four lines of action, and expand and expand and expand, adding in bits of research and story as I go. Finally, I add the dialogue and make the plot and subplots work, and once I have a first draft, I craft it into a final novel. Therefore, my writing day will depend where I am at in this process. A book called ‘Eat, Drink and Be Married,’ about a Greek girl in Nottingham, and ‘The Traveler’, which is a tad Matrix-like. Is there anything else you wanted to say to The Sweet Bookshelf readers? Just a huge thank you for your interest and support for The Dresskeeper. I hope you enjoy The Plaguemaker when it comes out, and please don’t hesitate to contact me via Prospera’s website with any queries or suggestions. Thank you so much for spending some time at The Sweet Bookshelf Mary! We can't wait to read what's next! I can't wait for her next book! I loved this one.